Travel editor Winsor Dobbin knows good things come in threes. Here are three great things to do outside of your comfort zone to make your autumn indulgently cosy. There’s a new place to stay in Tasmania and two gourmet events that might be enough to entice Sydneysiders interstate. Stillwater has been arguably the finest restaurant in Launceston for close to two decades now. It long been the place a culinary landmark, a promoter of fine Tasmanian wine and food and a place to see and be seen. Now the 1830s flour mill is also a mini luxury hotel. It is farewell to Stillwater’s upstairs providore and art gallery and hello to Stillwater Seven, which is billed as “a uniquely indulgent accommodation experience”. The seven striking rooms here – just a short walk from the Launceston CBD, all have waterfront views and their own inimitable style. Each room features locally designed and produced furniture, a luxury Tasmanian pantry and even locally sourced toiletries, as well as access to the private guest bar. Early in the morning guests are welcome to wander down into the restaurant to chat with the chef and see what is coming out of the oven. In-room features include king beds and king pillows, in-room pantries, Netflix and Spotify, Lentara Olive Grove toiletry products and spa quality 100% cotton towelling, as well as free wifi and USB bedside charging ports. An indulgent Stillwater breakfast is also included, as is parking and access to a guest lounge. Stillwater Seven is a short walk from both Cataract Gorge and the Invermay precinct. For bookings/info for Stillwater Restaurant and Seven rooms go to www.stillwater.com.au. It is fair to say that the great 20th-century artist Salvador Dali was a little eccentric. As is d’Arenberg winemaker Chester Osborn. It makes sense, then, that d’Arenberg is hosting a Salvador Dalí Art Exhibition at its McLaren Vale winery in South Australia until May 31. Art Evolution.com is presenting a major exhibition and sale of 23 Salvador Dalí bronze sculptures and graphic artworks, which will subsequently tour throughout Australasia. The collection is valued at over $6 million and has been exhibited in major cities and museums worldwide. It is on loan from the Dalí Universe in Switzerland. Founded in 1912, d’Arenberg has firmly established itself as a world-class winery. The opening of the d’Arenberg Cube in December 2017 saw the winery expand from the traditional cellar door to immersive food, wine and art experiences, including the formation of a contemporary art gallery, the Alternate Realities Museum, located on the ground floor. Complementing the Dalí exhibition, d’Arenberg is holding a gala event on April 6, inspired by the Rothschild Surrealist Ball in 1972, where distinguished guests such as Salvador Dali and Audrey Hepburn explored the boundaries of their imagination. 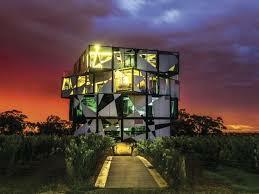 Guests will be encouraged to explore the five levels of the d’Arenberg Cube, including the Dali collection, while enjoying a selection of canapes, wine and creative cocktails, as artistic performers bring the story of surrealism to life. Tickets to the d’Arenberg Cube Surrealist Ball can be purchased online via www.darenberg.com.au/ball. Food and drink will take centre stage as the best producers, chefs, winemakers and brewers in Victoria’s High Country’s combine for a region-wide Feast Festival this May. A busy program of events will celebrate the outstanding natural beauty of the mountains, valleys, vineyards and villages of the region and the talented local folk. Feast High Country Festival is in its seventh year in 2019 and will include more than 40 events at cellar doors, village cafés, hatted restaurants, among the vines and by the light of bonfires from Mansfield to the King Valley, Beechworth to Bright, Rutherglen to Mount Beauty and Corryong to Falls Creek. Highlights of this year’s Feast Festival program around the region include Patrizia’s Harvest Forage with Bright foodie royalty Patrizia Simone. Take an early morning walk around Bright foraging for ingredients for your lunch then get the lowdown from the celebrated chef on how to turn your found produce into a five-course Italian feast. Also check out the Fermentation Degustation at Bridge Road Brewers in Beechworth (below) where founders Ben and Maria Kraus will host a four-course matched dinner with a difference, where fermentation is the hero of the night. In Merrijig, guests can join winemaker David Ritchie in a toast to the 50th anniversary of Delatite Wines, including a five-course degustation dinner paired with some special wines from the cellar. Lunch With Three Italians at Pizzini Wines in the King Valley will showcase Italian food, wine and opera with food by Adam Pizzini of Rinaldo’s Casa Cucina, Pizzini’s own Italian varietal wines, and opera courtesy of Catherine Pendelich and Ced Le Medelo.